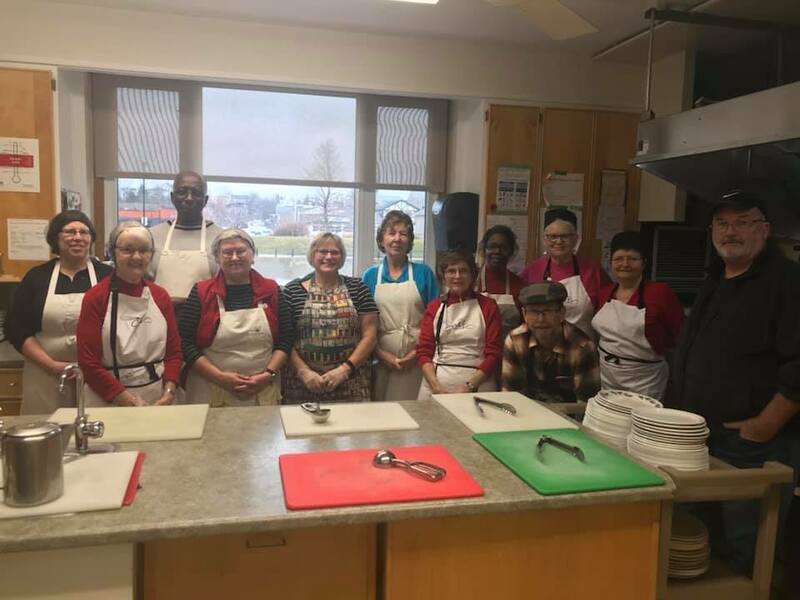 Launched in 1992, Trinity Community Table (TCT) is a community outreach program that provides nourish noontime meals in a hospitable environment to all in need. Meals are served in the Parish Hall of Trinity Anglican Church in Cambridge, Ontario. We serve up to 175 guests every Monday, Wednesday, and Friday (Except Good Friday and Christmas Day). In 2016, we served 19,000 hot meals. TCT receives no government funding. All financial and material gifts are used entirely to meet TCT objectives. TCT is an all-volunteer organization. Some 100 volunteers contribute more than 10,000 hours each year. The board of directors and other volunteers receive no remuneration. Help is always welcome and encouraged. You can help by volunteering your time to meal preparation, set-up, and serving, or to cleanup of the dining hall and laundry, or to the board of directors. You can donate cash, canned or fresh food, spices and condiments, and coffee, tea, or juice. Cash donations can be made online or sent to the office at Trinity Anglican Church, and food donations can be made during TCT hours Monday, Wednesday, and Friday to Trinity Anglican Church in the Parish Hall. You can also help by promoting our services to those in need and those who can help! Our volunteers do meal preparation, cooking, cleaning, laundry, grocery shopping, and so much more! TCT is grateful for all their hard work! Donations can also be made to the TCT by mailing or delivering a cheque to the church office at 12 Blair Road in Cambridge, Ontario, All donations over $10.00 will receive a tax receipt by the end of the year. Thank you!